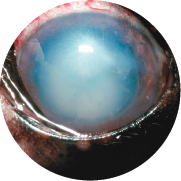 A dislocated (luxated) lens in the front chamber of the eye. The arrows mark the edge of the lens. 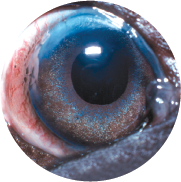 Lens luxation causing conjunctival redness and clouding of the cornea. 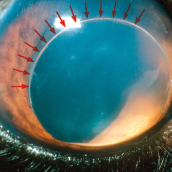 Yes, unfortunately primary lens luxation affects both eyes, although not necessarily at the same time. However, there will often be early signs of partial dislocation of the lens in the second eye at the time that the first eye is noticed to have a problem. Without treatment the second lens will then usually dislocate within a few months of the first, and the natural progression of patients with this condition without surgery is to become blind in both eyes. Glaucoma then usually develops, and this not infrequently means that one or both eyes may need to be removed in order to relieve pain. Eye removal is generally only recommended if the eye is painful and blind and the pain cannot be readily controlled with medication. The thought of an eye being removed may be alarming at first, but it is important to realise that this will generally make the patient feel much more comfortable and much happier very quickly.